Creating your blog and owning a website it’s easier than it seems! When we started two years ago, we didn’t know anything about blogging, we didn’t know about domains, hosting, WordPress, etc., and now that’s what we deal with everyday to support our Million Travels around the world! If we did it, you can do it too, you just need to know which steps to follow and you will have your own space on the internet in no time to show off your contents! Blogging is becoming more popular day by day, but there’s always space and demand for new content, provided it is original and passionate! And if you do a good job, then you can make some money from it. Choose your travel blog name. Build your audience and earn money! Your blog name is the first thing you have to think about. It can include anything you want from your name, your passion, or your niche, but don’t be too long. We suggest a short name composed by two or three words, something easy to remember and that represents yourself and what you are going to write about. When choosing a name make sure it is something new, browse social networks to see if anybody else is already using anything similar, and this takes us to step 2. A domain will be your personal .com address on the internet. Some platforms as WordPress and Blogspot offer free hosting but will show their domain in your address (e.g. mytravelblog.wordpress.com), but if you are in for the long run and have business/commercial ambitions with your website, then we strongly recommend to buy your unique domain (e.g. mytravelblog.com). Your blog will look way more professional and will attract more consideration, plus you’ll benefit from many services, depending on the plan you opt for. Check on NameCheap.com if your domain is available, you can either buy it there or later together with your host. After having verified that your domain is available, you are now ready to choose your hosting platform, where you can buy both your domain and your hosting space, where all your content will be stored safely. Our favourite host is SiteGround, we began with them when we launched our blog two years ago and we never had a reason to move away! SiteGround made it so easy and clear to get hosting that we can’t help but recommend it. They offer speedy servers, top-notch security and prompt support service 24/7. You can get a 60% discount if you click through THIS LINK when signing up! Choose your preferred plan: at the moment we are using GrowBig that matches our needs of having multiple websites, and is awesome value for money. However, SiteGround’s StartUp Plan has everything you need to start your own blog easily, it’s ideal for beginners. If you bought your domain on NameCheap, SiteGround will transfer it to their hosting for free! If you didn’t, simply click on “Register a New Domain”. Review and input your personal data. Complete your payment info, then choose your Hosting Service. We personally got 12 months of hosting and we recommend it as it is perfect to start your blog. For more safety, you can choose the Domain Privacy and SG Site Scanner, this are optional. Once you’ve completed your order and double checked your credentials through your e-mail, it’s done, you finally have a host and domain for your travel blog! If you want to check an alternative to SiteGround, we suggest Bluehost, definitely cheaper and convenient if you choose the 2 or 3 years option, which makes sense because if you’re reading here you’re probably in for the long run! And the payment preview. Again, you can optionally add the Domain Privacy and SL Security too. Whichever you choose you can then proceed to our step n.4. WordPress is where you will customize your blog inserting posts, pictures, videos, and whatever you like. From your SiteGround/Bluehost Website Setup, simply download WordPress tool and create your profile. WordPress is very user friendly, full of customization options, you will spend hours playing with this smart interface. You can follow WordPress tutorials here. Your theme is the look of your blog: at first, you can try some of the free themes powered by WordPress, later, after becoming familiar with your blog management, you can consider to buy a professional blog theme. Same goes for plug-ins: they are smart tools to get your website display what you want without knowing anything about coding. Want to show your social networks icons? Use multiple languages? Insert a map of your travels? There’s an ocean of plug-ins out there for you! You can mostly rely on free versions, however pro-versions are always available for small fees. Download from the “Popular” section to begin with. For a touch of personality, you can create your own logo for free on Canva.com. If after some time you’ll turn your website into a business, you can have an original logo designed by a pro at Fiverr.com. One of the best things of WordPress is that you can get your blog going without even spending a cent for the first months, until you decide if and when it’s worth investing more in it. Now that your blog is set up, you need to fill it with words! There’s no guide to this, just start adding original content to let readers know what you are all about. Divide your menu into useful sections (about us, destinations, blogs, photos, etc.) and write posts for each of them, so that your audience will have various things to read when browsing your website. Talking about audience, step 7 will tell you how to grow it. 7. BUILD YOUR AUDIENCE AND EARN MONEY! You want two things to happen: have readers coming to your blog, and have them returning to it. At first, you will spread the word by mouth to your friends and relatives. Then you have to create pages and profiles on at least two social networks: for photography related blogs focus on Instagram and Pinterest, for video contents use YouTube, and always keep your audience updated with Facebook and/or Twitter. Another useful way to get a loyal audience is to start collecting e-mails and creating a newsletter. How? Of course there’s a plug-in for that! When you start having good traffic, you can monetize your blog in different ways: advertising through Google Adsense, showing products with Amazon Affiliates, reviewing hotels and places you stayed in through your favorite booking platform, recommending where to find cheap flights or which insurance to sign up for, and many more. Our personal advice is never advertise what you don’t like, or better, just promote services you tried, you used and you truly love! Being genuine and passionate is the key for running your travel blog successfully! This should help you to have a better idea and dive into the blogging world. Be brave and never give up, you too can make your dreams come true! If you have any specific question, let us know in the comments below! GOOD LUCK RUNNING YOUR TRAVEL BLOG! -What do you want to do in your life? -I want to be a traveller! We are Ambra & Edoardo and our goal is to explore the world, inspiring you to do the same. 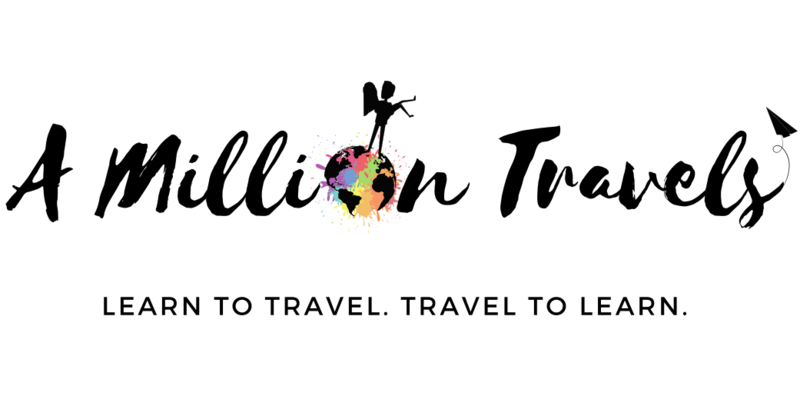 Join our A Million Travels!